Justice Antonin Scalia was known for his sharp-elbowed writing, which is preserved for posterity in his opinions. But his many memorable quips from the bench, usually during oral argument, are also an important part of his legacy. Nevertheless, Justice Scalia could crack up a room of his eight colleagues, dozens of lawyers, and scores of tourists and other spectators. Oral arguments will not be the same without him. Thanks to recordings preserved (for now) on the Oyez website, we can listen to the late Justice’s quips the way they should be heard: in his own voice. Below is a collection of Justice Scalia’s quips, in all but one instance from oral argument. One of Justice Scalia’s most cited quips has been criticized by some observers who suggest he was being unduly harsh to the lawyer before him. But listening to it today, Scalia does not seem particularly mean to the lawyer who, in a 1988 argument in McNamara v. County of San Diego Department of Social Services, is rifling through his papers to find a reference to “equal protection” in the opinion below. In the 2010 arguments in Brown v. Entertainment Merchants Association, the lawyer defending California’s law restricting the sale of violent video games to minors ran into a foe he could not vanquish: Justice Scalia, who would go on to write the majority opinion striking down the law. In the same argument, Scalia showed his grandfather side as he made an observation about how certain juveniles dress on the street versus what they might wear to court. In a 2012 argument in Henderson v. United States, about sentencing, an advocate was discussing a 1997 precedent, Johnson v. United States, which led Justice Scalia to wonder out loud whether he had been right to join the majority in the earlier case. 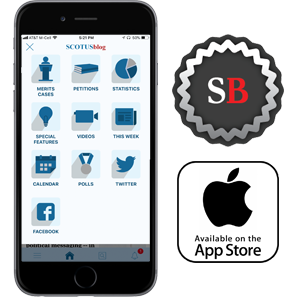 During the 2012 arguments in National Federation of Independent Business v. Sebelius, about the Affordable Care Act, Scalia challenged whether an Obama administration lawyer really expected the Court to analyze the text of the massive health-care statute. In a 2011 argument in Holder v. Gutierrez, an immigration case, Scalia had a quick-witted reply when Justice Stephen G. Breyer chimed in to remind Scalia and the arguing counsel of a salient fact of the hypothetical before them. Scalia was not immune from making a slip of the tongue, as he did in this opinion announcement last Term in Kerry v. Din. Listen closely after Scalia finishes as Chief Justice John G. Roberts, Jr., who sat on Scalia’s immediate left, whispers to him that he has misidentified a member of the Court. 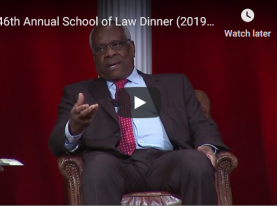 And Justice Clarence Thomas, who sat to Scalia’s right, gets in on the fun, and cannot contain his laughter. Remarkably, lawyers arguing before the Supreme Court all too frequently refer to a Justice by the wrong name. During arguments in 2000 in Bush v. Gore, Florida lawyer Joseph P. Klock more than once misidentified a justice. This led Justice Scalia, the class cut-up, to lead off a question to Klock in a way designed to ensure that the lawyer would remember him. No matter who said that line, it’s true. He was Scalia, and he will be hard to forget.